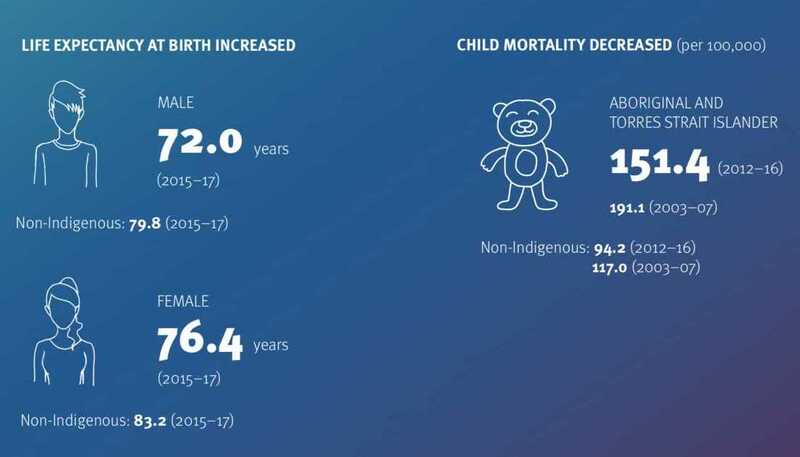 “For the past decade the greatest progress towards Closing the Gap has been in areas where Aboriginal and Torres Strait Islander peoples have led the design and implementation from the very start. “But we still have a lot more to do. This report card is a reality check and sets the tone as we develop meaningful, communityled solutions to create real change. Closing the Gap is a long-term framework that builds on the foundation of respect and unity provided by the 2008 National Apology to Aboriginal and Torres Strait Islander peoples. It acknowledges that improving opportunities and life outcomes for Indigenous Australians requires intensive and sustained effort from all levels of government, as well as the private and not-for-profit sectors, communities and individuals. 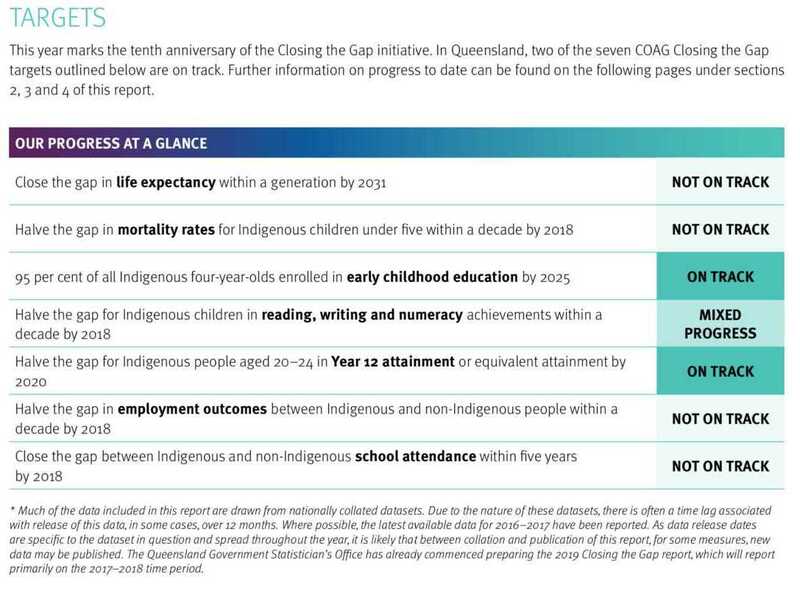 close the gap between Indigenous and non-Indigenous school attendance within 5 years (by 2018). 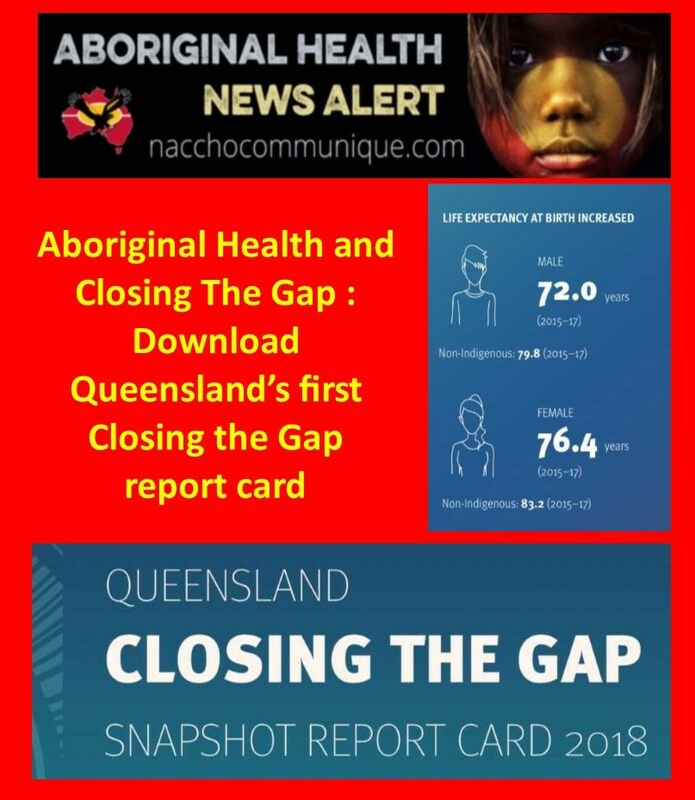 This Queensland Closing the Gap Report Card 2018 (Report Card) is an important step in the Queensland Government’s commitment to closing the gap between Aboriginal and Torres Strait Islander and non-Indigenous Queenslanders. It moves away from the deficit model and towards an approach underpinned by the strengths, knowledge and rich cultural heritage of Aboriginal peoples and Torres Strait Islander peoples. provides additional data on other priority areasraised by Aboriginal and Torres Strait Islander Queenslanders including through nine community consultations held across remote, regional and urban Queensland. The Queensland Government is committed and dedicated towards working in genuine partnership to guarantee improved outcomes that move Queensland’s Aboriginal and Torres Strait Islander children, families and communities from surviving to thriving.